In very cold but otherwise fairly benign conditions, John Hale (Cowley Road Condors) and Tony Turner set highly respectable sub 22-minute times on the Hardwick to Eynsham 10-mile course on Wednesday evening. Oxonian riders Malcolm Rose, Paul Warren and Matt Robson were the next fastest finishers, all going under 24 minutes. Emma McDermott was the fastest woman with a time of just over 27 minutes. 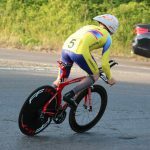 Next on the calendar is Oxonian’s two-lap, 36-mile hilly open TT centred around Charlbury, Chipping Norton and Shipton this Sunday (7thApril) starting at 10am, with Richard Gildea from Didcot Pheonix CC as the fastest seeded rider.